A PSD file is nothing but an image file which is layered and used in Adobe Photoshop. It stands for photoshop document which is the default format Photoshop for saving data. PSD is an advanced file type that allows the user to work with the individual layers of the images even after the file has been saved. Whereas, HTML is a popular programming language which is used to develop web pages and web applications. It stands for hypertext markup language consisting of multiple shortcodes which are read by the browsers. Then, those codes are converted into PSD to HTML Conversion Services for readable version so that website visitors can read those files. When the PSD files get converted into HTML codes, a readable version of the designs is created, which is then published in any web page or website. If you are planning to do the same but you are not finding any reliable provider within your budget, connect with us. We at Tech Support Dubai have a crew of skilled engineers who can offer you PSD to HTML services at a reasonable price. PSD files are quite complicated and their conversion process involves several critical steps. You need huge experience, great proficiency and 100% accuracy to perform it. 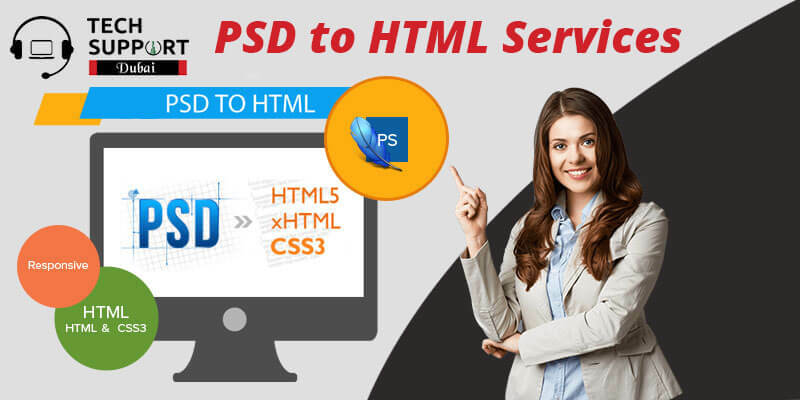 Have a glance at the various advantages of PSD to HTML conversion process. Finding the right solution to convert PSD into HTML is not an easy task. You should be careful while choosing the perfect service provider who can run this process accurately. Our professionals at Tech Support Dubai have many years of experience in PSD to HTML conversion services. We are the leading PSD to HTML5 conversion service provider in the market. We work tirelessly until your project is completed and you are fully satisfied with our services. Our experienced professionals offer class apart services, some of which are mentioned below. Our experts offer unmatched services with the help of our skilled professionals. They are certified and have a reputation for resolving numerous related issues with accuracy. Additionally, you can avail our advanced amazing services at your doorstep via our on-site assistance facility. We also offer cost-effective pricing, free consultations, 24*7 customer service and quick response. Give us a call at our helpline number by dialing: 042053349 and get in touch with our experts. They will provide you with PSD to HTML Conversion Services at a budget-friendly price. In addition, you can drop a mail to us stating your queries and receive a call back from us within the next 24 hours. You can also talk to our experts at Tech Support Dubai via our live chat option and avail instant guidance from them. Connect with us and start enjoying the benefits of a successful conversion of PSD to HTML.